I haven’t been to Washington DC in a while, but I think I might go on this scavenger hunt the next time I’m in town. Got any cash? You can, too. Just check the back of the bills and find the buildings depicted there. It should be a pretty educational tour. I also like the folded bill photo trick. Reminds me of squishing people’s heads between your finger and thumb. I might add that to my tour, too. This entry was posted in Games, Humor, Travel and tagged dollar bills, games, Humor, money, scavenger hunt, sightseeing, tour, Travel, Washington DC. Bookmark the permalink. haha this is such a cool idea! I saw this while scrolling wordpress and thought it was a really fun idea for an activity with friends or family! Thanks to the poster for sharing! 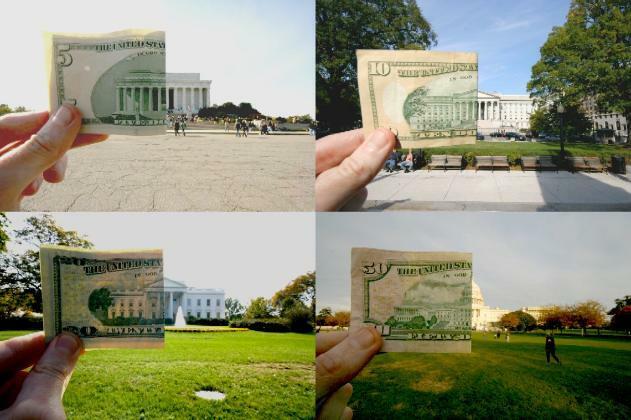 Awesome idea for when in D.C!